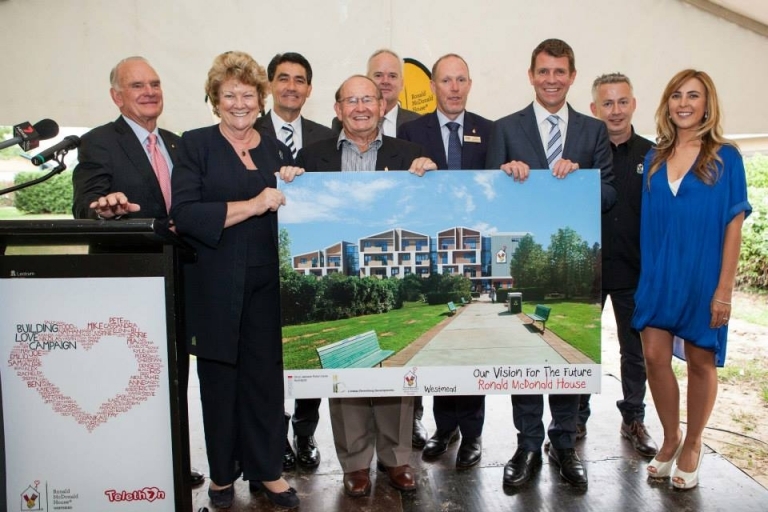 New South Wales Premier Mike Baird joined families and friends of Ronald McDonald House Westmead on Valentine’s Day to celebrate the launch of the Ronald McDonald House Westmead ‘Building Love’ fundraising campaign. The Building Love campaign aims to raise funds to build a brand new Ronald McDonald House at Westmead to help meet the demand of families in need of a place to stay whilst their ill child seeks treatment at The Children’s Hospital at Westmead. To open the House by December 2016, the House needs to raise $30 million dollars. Joining Mr Baird to show their support for the campaign were NSW Minister for Health & Minister for Medical Research Jillian Skinner, Geoff Lee Member for Parramatta, Lord Mayor of Parramatta, Councillor Scott Lloyd, Julie Owens Federal Member for Parramata and Channel 7 personality Mark Ferguson. NSW Premier Mike Baird today announced the NSW Government was donating $10 million towards expanding Ronald McDonald House at the Children’s Hospital Westmead. “As a parent, it’s hard to imagine anything much worse than finding out the most important person in your world … your child … has a serious illness,” Mr Baird said. Health Minister Jillian Skinner said Ronald McDonald House Charities provide an important service for regional and rural families. Ronald McDonald House Westmead Executive Officer Mike Thomas was thrilled to launch the Building Love campaign with the generous support of the NSW Government, Ronald McDonald House Charities Australia and Channel Seven. Along with Mark Ferguson there were a number of Channel Seven management and staff their to help celebrate the launch, as well as announced their support in the form of a Channel Seven Telethon taking place on 16 May 2015 to help raise the much needed funds. “In 2013 we were forced to turn away nearly 400 families from our doors as we just did not have the room. That is nearly one in every two families who came to us during the toughest time of their lives. There is an urgent need to build a new House to accommodate the families of seriously ill children who need to stay together, and we need as much community support as possible to help build the House these families need,” said Mr Thomas. “We know families are stronger when they are together and our new House will be a place of comfort, love and hope to even more families in need. With the help of the NSW Government, Ronald McDonald House Charities and Channel 7, community members and local businesses, we look forward to seeing the House that love built open in 2016,” concluded Mike Thomas. Ronald McDonald House Charities® (RMHC®) is an independent charity that that helps seriously ill children and their families. The cornerstone program of RMHC, the Ronald McDonald House® Program provides a ‘home away from home’ for families of seriously ill children being treated at nearby hospitals, and gives families the opportunity to stay together to support their sick children. Other programs include; the Ronald McDonald Family Room® Program which provides a relaxing haven within hospitals giving families a break from the stress of many hours spent by their child’s bedside and The Ronald McDonald Learning Program which helps children catch up on missed schooling following a serious illness. As well, The Ronald McDonald® Family Retreat Program provides families with seriously ill children a week’s free accommodation, enabling them to reconnect and enjoy a holiday when they most need it and can least afford it, and the newest program, the Ronald McDonald Care Mobile taking specialised health care professionals to children in regional and remote areas. McDonald's Australia pays RMHC's general and administration costs so that 100 percent of every donation goes directly to their programs.